When I made my Brownie promise as a 7 year old in 1979 I didn’t think twice about promising to “do my duty to God”, I remember being a bit concerned about the “serve the Queen” bit though. The Brownie handbook did a decent job of explaining that “serve the Queen” was shorthand for looking after the country around you and the people in it which seemed reasonable enough so I got over that. As the years went by and I made the same promise as I stayed in the Guide movement as a Guide, Ranger and Young Leader I got a bit more dubious about the “duty to God” part and by the time I left, a decade after I joined the Brownies, I would have described myself as agnostic. The process of changing from a child who accepted whatever religion she was given to a questioning adolescent was ironically accelerated by helping out as a Young Leader at a Brownie pack attached to a Roman Catholic church where the nonsense of different varieties of religion thing became increasingly clear to me. Fast forward another twenty-something years and I find myself back looking at the Guide and Scout movements from a different perspective. As the atheist mother of a child being raised as a atheist who would like that child to have the benefits of those organisations but who knows the child would baulk at promising anything to do with God even if it were explained to not necessarily mean a religious Churchy version of God (neither Guides nor Scouts have ever been Christian organisations as far as I am aware, I knew that Guides encompassed all sorts of religions when I had my “Brownies around the world” posters as a child). Making promises you need to weasel your way round to fit yourself helps no one. So when the Guides openly asked for opinions on changing their promise earlier this year I was pleased to tell them what I thought, from both child and parent points of view (along with 44 000 others). So I am really pleased to see the announcement of the latest revision of the Guide promise which includes the wording “To be true to myself and develop my beliefs”. It’s great to see that they have picked one promise for all that can be discussed and interpreted how you choose and ‘develop’ allows girls to change as they grow older; I certainly didn’t have the same beliefs at 7 and 17. I entirely agree with Gail Edmans writing in The Independent that Guides have never been about religion. For me they were all about being outside with friends, camping, lighting fires, toasting marshmallows, tying knots, learning new stuff about the world, other people and myself. The Promise was one of the things that made the Guides special, it wasn’t just any old youth club, there was commitment involved, there was opportunity to think about things as well as do stuff. I’m pleased that the Guides are still thinking and still changing and still helping girls make the most of themselves. I should probably add that my eight year old daughter is more interested in joining the Scouts at the moment… come on “boys”, catch up. We had a family break in Amsterdam, it was the second time we’d visited, and I wanted to take a trip out of the centre of Amsterdam to get a bit more milage out of our hire bikes. In the UK we try to research carefully before taking our eight year old out on the roads and trails, too much traffic or too many hills make for a miserable time for all rather than an enjoyable ride. 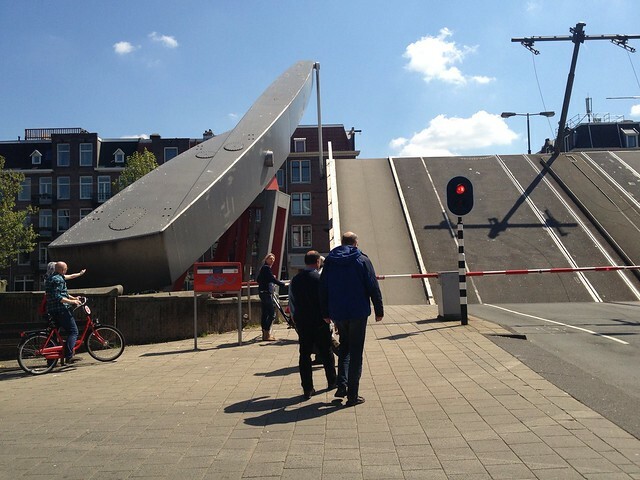 In the Netherlands you know there won’t be the hills, and that the bike infrastructure will be good, but I was still a bit uncertain about taking a longer bike ride. We’ve had a couple of hair raising incidents on bikes in the centre of Amsterdam – mostly down to the adults not being entirely familiar with the way of bikey things in another country: we didn’t realise the tram lights would only give a ten second window for bikes to cross (we stuck to waiting for the green man and walking over tram lines after that) and we got a bit confused over the presence of speeding mopeds on bike paths too (apparently they are supposed to be there, but I’m guessing they aren’t supposed to act as if they are there to run everyone else off the road either). I know we’re the annoying tourists on hire bikes to the locals, but we’re not the only ones and we have a really good time riding around. 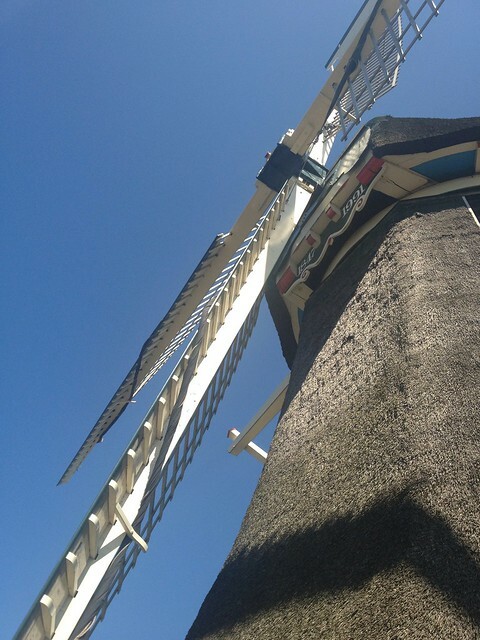 Looking around the tourist attractions we spotted Molen van Sloten, a working windmill open to visitors on the edge of Amsterdam. It got good reviews and we decided to spend a sunny day going out to visit it. I’ve plotted the route we took on a map as it turned out to be a glorious ride. I’ve started the map from by the Rijksmuseum on the edge of Amsterdam city centre as anyone who visits Amsterdam will find this area. We were actually staying in the Plantage area in SE Amsterdam over to the east of the map which added a couple of miles on to each leg of the journey. 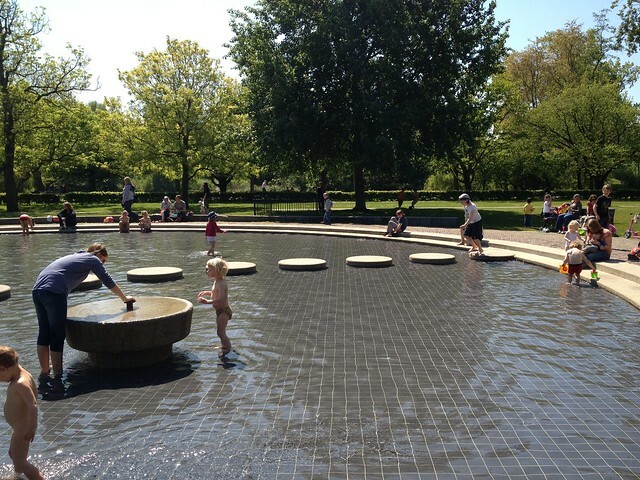 The route took us through Vondelpark, a marvellous city park with lakes, playgrounds and cafes and we stopped off at the paddling pool so Miranda could play for a while. The bit of the route after the park is the bit I would change if we went again as it took us through a busy junction (Hoofddorpplein) that was a bit tricky to navigate with an eight year old. I think I would go straight on after leaving the park and crossing the canal and follow the road round. In fact I think this is actually the way I meant us to go but I find looking after Miranda cycling, not losing Darren, and navigating a bit challenging at times! It did however take us past a bridge that was lifting to let a big boat past which is always a bonus. Once we got onto the main road out to Sloten, it goes by various names but seems to be the S107, the road was fabulous. We were cycling along an almost deserted bike path in the dappled shade of the trees with the canal on one side totally oblivious to the wide road passing by on the other side of us. What had worried me were the number of roundabouts that we needed to negotiate. 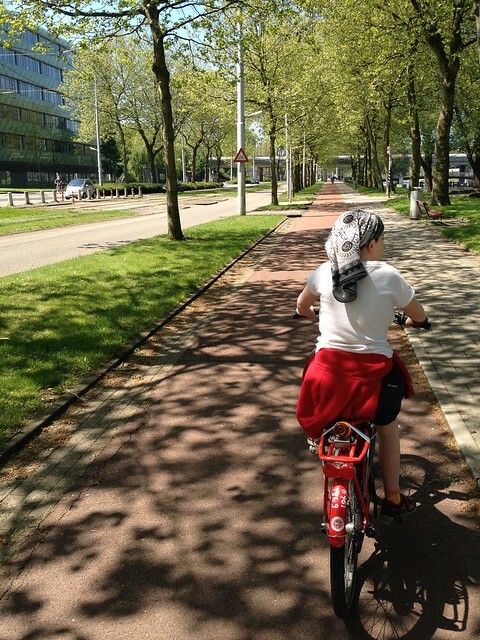 I won’t worry again – when a Dutch cyclist approaches a roundabout they zoom straight across the bike path and the cars stop for them. It’s marvellous. And when we got the windmill it was worth the trip. It’s not a highly polished tourist attraction and it has one of those mish-mash museums full of model ships, barrel making and other almost random exhibits attached. But the tour, in English, from a highly knowledgable guide was fascinating. The mill is still working, though the miller was on holiday on the day we went (which meant we could get up close to the sails), and is used to pump water out from one set of canals to the next in order to keep Holland dry below sea level. It had never really occurred to me that windmills did more than grind flour but now we know all about NAP water levels and how to signal messages from town to town with windmill sails. All in all it was a lovely day out, we stopped in Vondelpark again on the way home for coffee, chocolate milk and bouncy castles. The ~14 mile bike ride was well within Miranda’s capabilities and it was nice to get out of the middle of Amsterdam (much as I like it!) and see a bit more of the area. Can you beat me at geoguessr? I expect you can, I hadn’t realised you could move around a bit – looking for road signs is helpful. Though actually I’ve only done worse since I discovered that you could move so maybe there is some truth in the idea that you are better going with your first impression. I was quite pleased to have guessed most of them to the right continent. 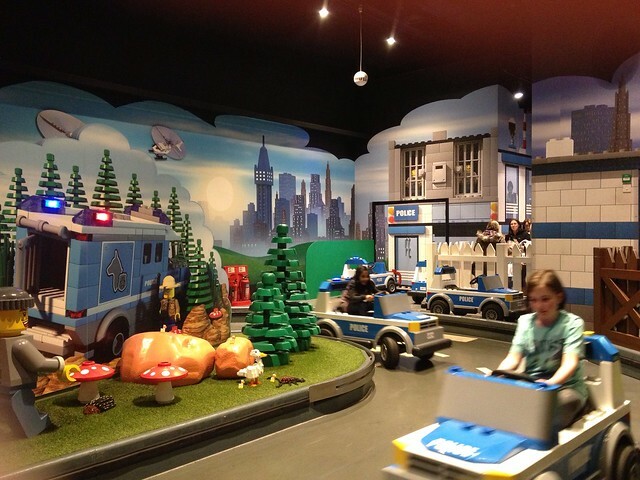 I wrote up our visit to the Legoland Discovery Centre in Manchester after we visited when it first opened in 2010. We recently revisited and I thought it was worth making an updated post. We visited with our now 8-year old daughter and took a friend along with her this time. Not that much has changed since the first visit really, but enough that I’m feeling better able to recommend it as a good day out. Merlin’s Apprentice – Seemed to be a long queue for a short ride. A carousel where you pedal to get your car to go up in the air. It’s set up for two children or an adult and a child to ride in each car. From memory the children had to be over 1.2m to ride by themselves. In case you don’t have enough adults to go with smaller children the Lego staff were around to act as chaperones. Which I’m sure is a lovely job to have but it’s a bit annoying when only 12 people can ride at once and a couple of them are staff each time. And there is no way for adults to ride without children. Since the two children with us wanted to ride together, the adults couldn’t ride, which isn’t really a problem – it’s a kids day out after all – but when you are being charged the same entry fee for adults as children it would be nice to have a bit more fun! Forest Pursuit – Drive a pedal car and get a driving licence is pretty much a Lego standard ride and it is the latest to come to Manchester. The kids enjoyed it but had to buy their photo licences at the end (at Windsor they got a card licence free) and the £8 fee seemed a bit steep although having two children for the day meant they could take advantage of a 2 for £10 deal. I got very annoyed having to wait around to buy the licences though as the desk was unstaffed and the ride staff didn’t want to help. Our 8 year olds were under the 1.5m height limit but this was being strictly enforced and some older children were being turned away disappointed. Most other things were as they were before. We noticed improvements at the Fire Academy playgym which was staffed and being queued for – though the queue was being jumped so it could have been better organised still. We got a table in the cafe without a problem, though it was busy. Miniland seemed better maintained than before and the new Star Wars displays were nice. The “girls” Lego area (I will restrain myself from giving my full not very complimentary opinion on “girls” Lego here!) has changed to the new “Friends” brand and seemed to have some kind of not-working very well karaoke going on, we didn’t investigate. 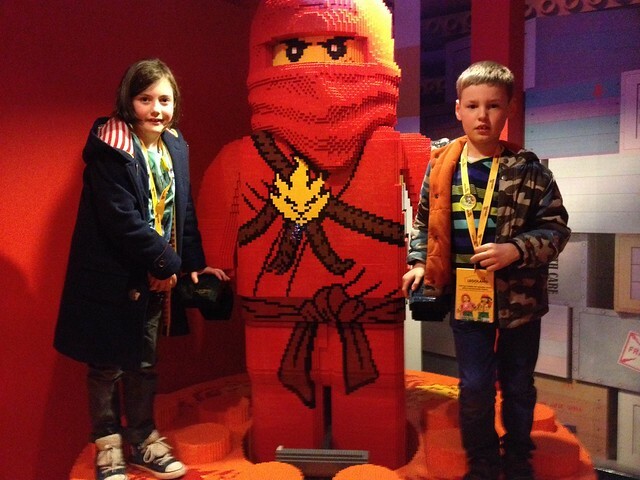 Oh, and the 4D cinema had a new film about Lego’s new Legends of Chima range which the kids enjoyed – I was pleased they weren’t playing the same films as three years ago although I didn’t think this was as good as the ones we had seen before. Last time we were out within a couple of hours so this time with the extra rides I had allowed for about three hours before they were bored. We spent most of our time queuing and riding and we left after about four hours having not really got onto building any Lego yet! Don’t worry, they went home with plenty from the shop! All in all it was a better experience than the first time, although it was busier and we spent more time queuing. We could have spent longer there. It still seems quite expensive, even at online pre-booked ticket prices. Do pre-book still, we had to queue for 10 minutes or so with pre-booked tickets, it was an hour or more without. Legoland claim the centre is suitable for 3-10 year olds and I think that’s about right – if I get round to it I’ll probably take Miranda, aged 8, back for a last visit in the next 18 months or so, much beyond that and it would only be worth visiting with younger visitors in tow as she’d be too tall to do everything. I fancy another dive into the big Lego car making box…. Having changed our business around in the last few months I’ve been able to get out and about a bit more without feeling like I ought to be back at my desk all the time. Whilst I’m out in the morning, walking up to the school, instead of dashing home to get straight to work I’ve been taking the time to have a longer ‘commute’ – looping around the lanes for a 2/3/4 mile walk several mornings a week. I’ve been exploring places I don’t know at all despite having lived here for years now. A couple of weeks ago it was a sunny but cold morning in the town, 500 feet above sea level but sheltered in the valley. I took a walk up some farm tracks and ended up coming down a path that despite being labelled as a track on all my maps (which usually means ‘passable by farm vehicles’) was very much a stony footpath that obviously turned into an almost-a-stream in the rain. Except it was cold and icy. So I was clambering down what felt like a frozen waterfall. Very carefully. I got home in one piece and told myself off for being an idiot for not turning around and going the long way back. I realised how easy it was to misjudge paths and weather conditions. I wasn’t going to do that again. Two days ago we woke up to more snow than I remember seeing here before. Over the weekend the roads have all been cleared and by this morning the town was, though still very white, back in civilisation again. I decided there was no reason not to go for a walk. I picked a ~2.5 mile loop up the hills and back down into the town, no wandering off onto footpaths or anywhere I didn’t know. 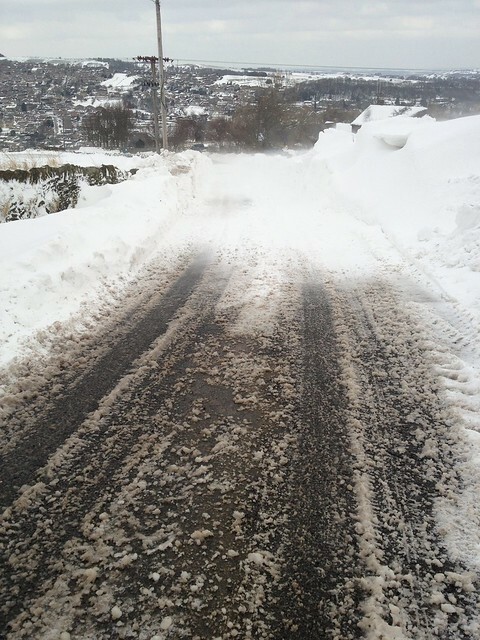 All on good roads that are usually gritted and ploughed. There was no problem getting up to the top of the hill and round. After about 1.5 miles, heading back towards home, I came across a stretch of road where snow from the field was blowing over the road. 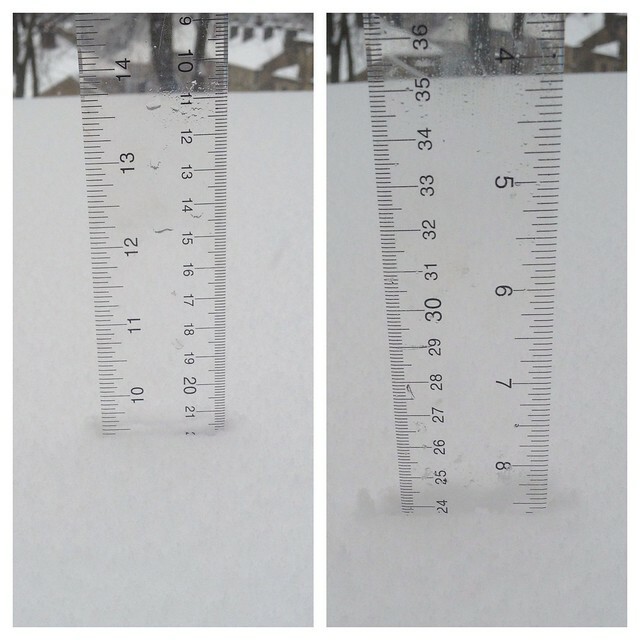 I stopped and took a photo to show how bad the snow drift was. Then walked through it – for about 50 metres or so it was complete white out walking down the road through the blowing snow. A little further on I found the road vanished beneath a snow drift. 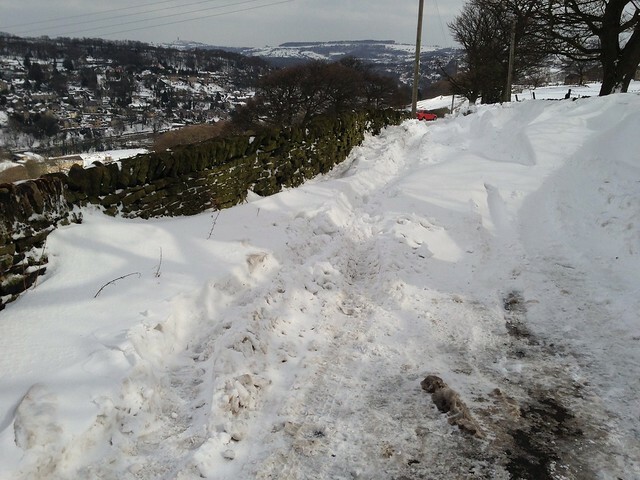 The gritters and snow ploughs clearly hadn’t managed to get along this stretch of road. I carried on walking – how bad could it get? I really wasn’t that far from the town. 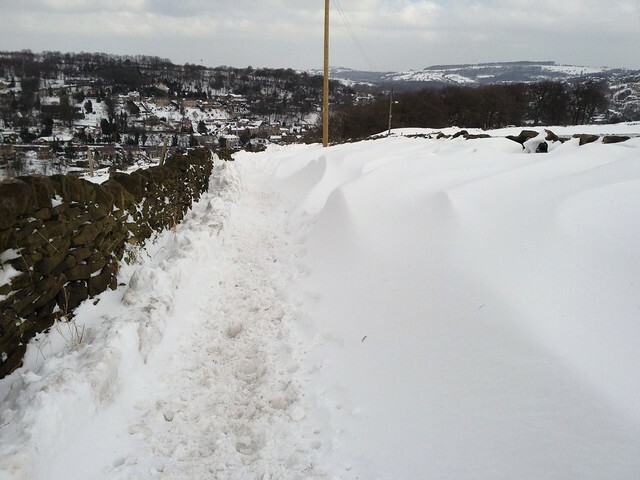 The drifts were getting worse but they must be nearly over. I was just about managing to find a path past them. Then it really got bad with snow banks completely across the road from side to side. I stopped taking photos at this point, deciding that my phone was better off safe in my pocket and my hands were better off helping me scrabble over the snow banks. It got worse before it got better though. I was only a couple of hundred metres from the town when I took that last photo but they were a long, rather scary, couple of hundred metres. It’s easy to see how people end up in trouble on snowy hills though. This road has been fine in the snow before, and other higher roads were clear, but the local conditions here – the snow on the fields and the wind – made it very different to places that seemed similar. And, exactly as when I found the icy waterfall path the other week, I thought it was easier to go on than to go back. Lesson learned I think. I hope. Also, I am very ready to greet spring! 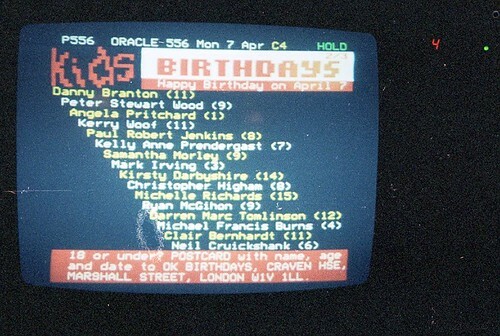 I have far more affection for Ceefax, the Oracle and 4-Tel than I have for most things broadcast on the TV. I’m much more of a textual data person than an audio/visual one, even when you have to wait for the pages to flick over. Sad to hear of its demise. A few months ago Darren bought an etching press. It weighed approximately a thousand tons and I helped him get it up to one of our attic rooms. (I may be exaggerating both the weight and the amount of help that I gave.) Since then he has steadily been producing a range of fabulous prints and we are currently celebrating as he is going to supply some for sale at the Craft & Design Gallery in Leeds next spring. This one, Blue Trees at Avebury, is one of my favourites. 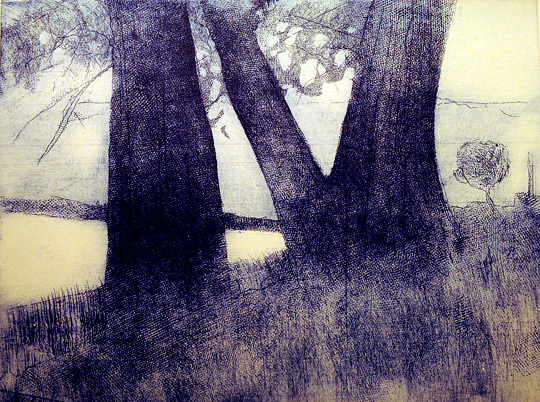 You can read and see a lot more about his prints over on his dreynoldsart blog. He’s also set up to sell original prints via Etsy and Saatchi Online. We use the Transpennine Trail around Penistone a lot for nice flat safe off-road family bike rides – it’s a lovely old railway route and Penistone has good café, supermarket and ice cream stops for all your bribing-seven-year-olds-to-bike-a-bit-further needs. The on-road option will travel from Kirkburton through Stocksmoor, Shepley, Haddingley and Royd Moor to join the Trail at Millhouse Green. This route will be available for walkers and cyclists. The off-road route will be slightly longer and travel from Kirkburton, Shelley, Shepley, Cumberworth Common, Denby Dale, Upper Denby, Ingbirchworth, Royd Moor to join the Trail at Thurlstone. This route will be available for walkers, cyclists and equestrians. This still wasn’t enough for me to be able to piece the route together, so this afternoon Darren & I drove our bikes up to Kirkburton to find the start of the new routes. 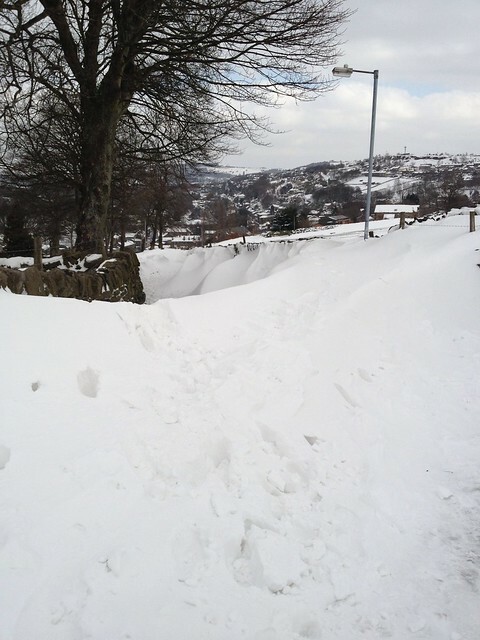 The off-road route starts on Box Ings Lane opposite Kirkburton Health Centre (on a Sunday afternoon we felt it was reasonable to use the Health Centre car park) and is labelled as 11.5 miles to Millhouse Green. We spotted the start of the on-road route a little further north down the main road nearer the centre of Kirkburton, that one is labelled as 9.5 miles. Unfortunately we were unimpressed with the off-road route from the start. I missed the second sign and cycled up a driveway rather than the bridleway, fortunately Darren saw it but the path was much more of a ‘footpath’ than we had expected, very rocky and uphill and we ended up walking fairly quickly. Our bikes are hybrids but they weren’t really up to the roughness of the path and in places it was very narrow. We only bumped into a couple of dog walkers though. The path got better as we went on, turned into a farm track shortly before meeting Penistone Road. There is a short on-road section down to Dam Hill. The second section of off-road track is even worse than the first, before it turns into Long Lane which is a decent path with good views through farmland that takes you to Shepley. The route passes through Shepley on roads (Field Head, Lydgate Lane, a short bit of the main Abbey Road, and on to The Knowle) and leads onto a bridleway marked as High Moor Lane on some maps. This started off as what I think was supposed to be a grass track (no grass,very muddy) and then the downhill section was like riding down a stream. A bit too exciting for me, and my bike wasn’t really up to it. When we hit the left turn onto Copley Lane at the bottom we decided we’d had enough even though we’d only covered 3 and a bit miles of the trail. We definitely weren’t going to retrace our steps to go back upstream so we gave up following the trail for the day. We may try again in the future (hence ‘Part 1’ in the post title! ), but we won’t be trying this section again. We carried on up Near Bank to Shelley, found a bench with a view for our picnic and took a quick spin back down Huddersfield Road to the car. We didn’t bump into any other cyclists on this part of the trail, which didn’t really surprise us given what we found. I would have enjoyed walking it, but it wasn’t particularly suitable for family cycling without mountain bikes. I’m more inclined to try out the on-road route next time! This was the first time my car had needed a service since I had fitted the bike rack on the roof. Journey 1: After morning rush hour, from home to the garage. By car. Distance 8.5 miles. Time 32 minutes. About 16mph. Journey 2: From the garage back to home. A lift into town, walk across the town centre and the bus home. Time approximately 1 hour and twenty minutes. About 7mph at most. I don’t generally mind buses but this one was a hot bus when I was dressed for a chilly day, my head was achey and I felt travel sick. Journey 3: To the garage to fetch the car in afternoon rush hour. By bike. Taking a longer almost 10 mile route along nicer roads and checking whether the canal towpath and a greenway are suitable for riding with Miranda at a later date. Time 54 minutes. Just over 11mph, would have been rather faster if I’d stuck to the main roads I guess. Conclusion: 11 is not that much less than 16 (and could be speeded up a bit quite easily). And the bike is a lot more fun than sitting waiting for the car in front to move. Next time I will take the bike with me and do Journey 2 by bike as well I think, though it may take a little longer as it is more uphill back. Can’t be worse than the original Journey 2 though. Journey 4, back home with the car, with the bike on the roof, was slightly quicker than Journey 1 had been. It still didn’t top 20mph though.